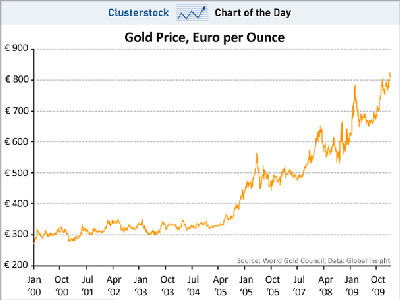 Disappointed that gold isn’t regularly busting to new highs like it did last year? You’re just looking at it wrong. In euros, a currency that’s come under serious pressure, gold is basically at an all-time high. In other words, it’s not gold that’s gone up or down, it’s changing attitudes towards underlying currencies that has changed. When gold sells off against all the currencies — because investors suddenly have a new found love of paper money — that will be a story.